Barn Cottage is an elegant village house with a separate Cotswold stone barn with planning permission. Originating from the 1600’s, Barn Cottage has recently been the subject of a complete bare wall renovation, and extended by the current owner to a high standard with enormous style and character, to create a wonderfully elegant village house. The accommodation, which is well appointed and flexible, is arranged over two floors with good ceiling height, creating a light and airy living space. 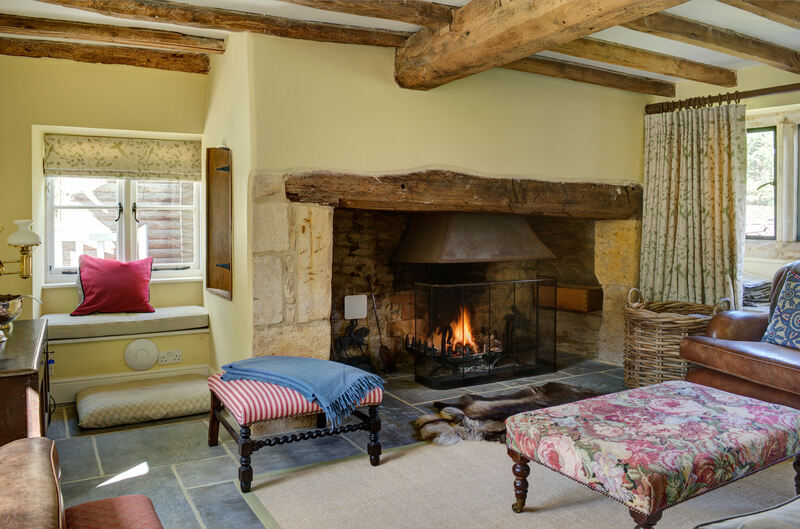 Beautifully presented throughout, high quality fittings and underfloor heating are complimented by original period features, including inglenook fireplaces, mullion windows, elm floorboards, and some exposed elm and oak beams. 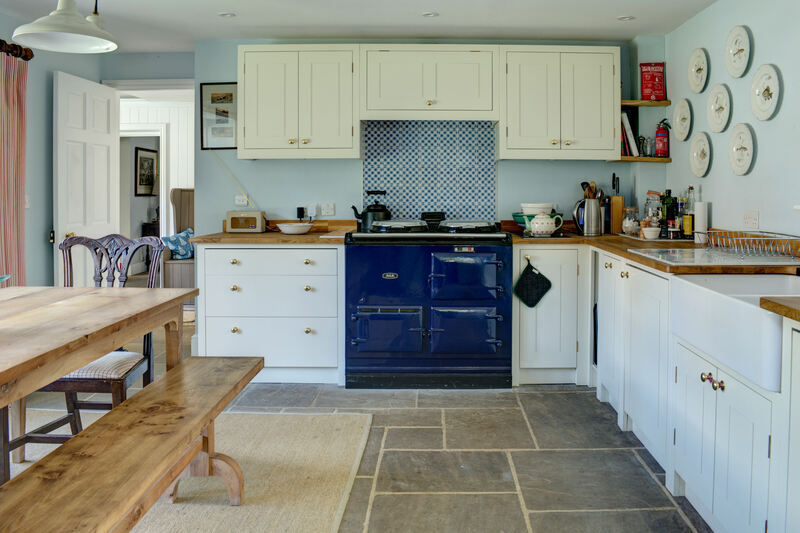 Barn Cottage itself offers a beautifully appointed kitchen- breakfast room with an electric Aga, a sitting room with an open inglenook fireplace, and a lovely dining room with a wood burner in another inglenook. A fourth bedroom is found on the ground floor, with French windows into the garden, and a shower room. The first floor comprises a master bedroom and bathroom, a guest bedroom and bathroom, and 3 further bedrooms with a shower room. The barn is located close to the main house and is a beautiful, traditional stone barn, which now has planning permission to be converted into a ‘party barn’ with two additional bedrooms and bathrooms, a cloakroom, kitchen and study. Barn Cottage is in the much sought -after village of Bledington, centred around the village green and duck pond, and comprised of period Cotswold stone properties. Bledington enjoys a wonderful community spirit with its’s renowned, award winning pub, The King’s Head https://www.thekingsheadinn.net. It is one of the last remaining villages to have retained a village hall, a beautiful parish church and primary school. In addition, the village will shortly open their own community shop. The towns of Stow-on -the -Wold and Chipping Norton, about 4 and 6 miles distance respectively, have excellent shopping, recreational and business facilities, and the award winning Daylesford Organic Farm Shop is only 5 minutes away https://www.daylesford.com. Soho Farmhouse can be reached in less than half an hour https://www.sohofarmhouse.com. The neighbouring village of Kingham has several excellent pubs, The Wild Rabbit https://thewildrabbit.co.uk and The Plough https://www.thekinghamplough.co.uk. Further facilities and extensive leisure amenities can be found in Oxford and Cheltenham. The schools in the area are excellent, with Kingham primary and private secondary school, and The Cotswold School in Bourton -on-the-Water. The Ladies College, in Cheltenham and Radley College, near Oxford offer good private school options. Local sporting facilities are superb. There are many leisure centres to choose from, if one is so inclined, and there is racing at Cheltenham and Newbury; polo at Cirencester Park; golf courses are at Lyneham near Kingham, Naunton and Burford ,and there is fishing at Lechlade and on the Windrush. Oxford, Cheltenham and Stratford-upon-Avon offer excellent cultural activities in all spheres with numerous with literary festivals. Giffords Circus plays Daylesford every summer!